Today I have a lot to share with you which will be fun and exciting,so I hope you will read through! I have never done a “product review” on my blog. A box full of spice powders and ready to mix curry packs arrived from eastern condiments. Seriously this is my first product review and I love the samples send by my friend, Aveta of Eastern Condiments. I was really surprised when Aveta asked to write an unbiased review for some of the products of Eastern Condiments P Ltd. Lets have twist with tasting different flavors of their masala powders. Almost I have tried all eastern product masala powders and felt the taste and spice level content...On going through their website I came to know that they are very famous in the Middle Eastern countries as well as USA. · It’s clear, direct and easy to follow. The ease of preparation varies depending on the recipe. The have a wide variety of products which has an exquisite flavor and taste in it. 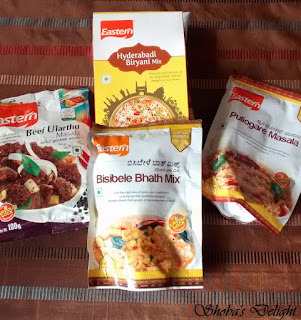 They have launched a few products with the ethnic taste of Karnataka. Here my family members love the flavored rice and one among our favorites happens to be Bisibela bath. 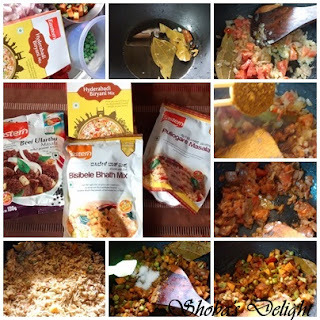 And each of the products had very well explained recipe behind the packet, which was easy and simple to follow. Now the concept has totally changed because of our busy lifestyle. Hardly have we got time to do all the steps and make our own spice powders at home. Though I prefer to make home ground spices, however do not get time. Hence, I have to rely on the store bought spice powders sometimes for emergency cases. Usually we bloggers prepare Homemade masala powders and now it’s time to taste the Eastern product. It’s an easy way process with the steps directed behind the pack and tastes different. Being In Bangalore, I have been doing this recipe for at least once in aweek.It’s actually a one pot meal which is fast to cook and tastes yum when it’s served hot. the aroma of the coriander and til seeds was so evident in the masala. Everyone liked it and the color was very good. Cinnamom, clove and til seeds was sensible and all the spices were added perfectly like according to the measuremnets.The spice flavors and the color in this bisibela bhath powder mix is really favorable and blends well with rice. The look was very appealing and keeps expecting more when you try out once. The masala powder is well balanced, that is, the spice and flavors are not overpowering. It is just like what we prepare at home, except for the salt. On the whole as I said, it is like our home made masala, anyone can go for Eastern Bisibela bhath powder without any second thought. This is the first time when I made some thing with readymade masala, and believe me it is so easy to cook and yummy to taste. 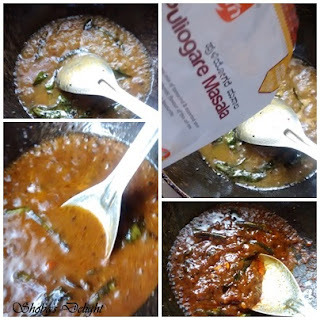 This product is damn spicy and when I tried for the first time, my family members could not eat with enjoyment. So I tried to reduce the quantity of the spice mix to briyani. Eastern have suggested Biryani masala for so many biryani varieties like Eastern Bombay mix, Sindhi biryani mix. 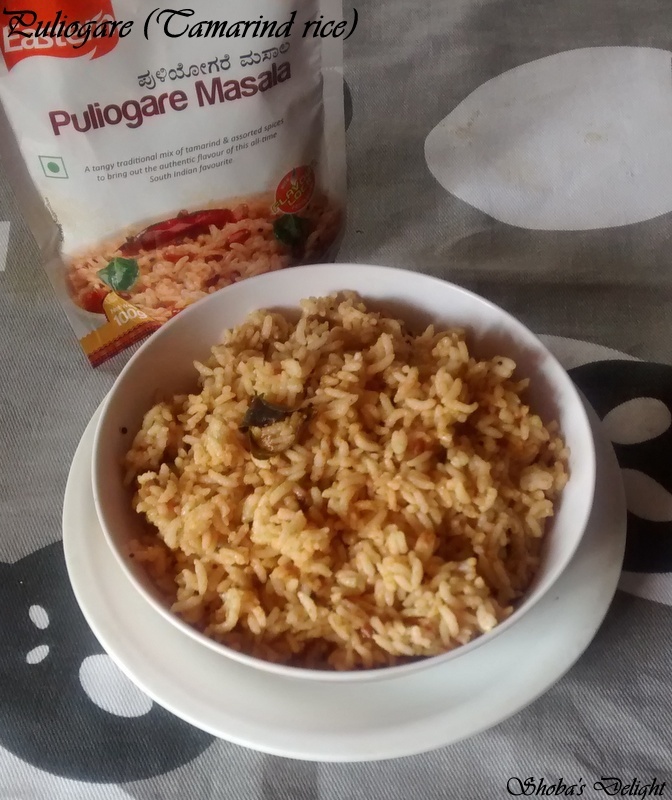 Try to get all the biryani masala mix and feel the taste.The powder imparts a lot of spice and a strong flavor. The final product which I tried is one of my favorite recipe from childhood is Puliogare, where I always get in temples. My mom prepares this mixture by roasting and grinding the dry spices. Voila...Now days we get in packet versions, I assure you that this Puliogare powder mix is damn good and tastes just like my mom does at home. Every spice in this packet is well balanced and the aroma and taste of tamarind was very prominent in the masala. If it has more peanuts, it would have been nice for the colorful texture. 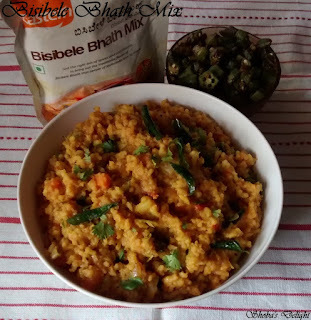 My kids always love the spicy flavor which is perfectly blended in this mix. Totally I was enjoying my Puliogare with my family. Note: This is an unbiased review which is purely based on my own taste & preference. Thanks Eastern Condiments for giving me an opportunity to review your products. 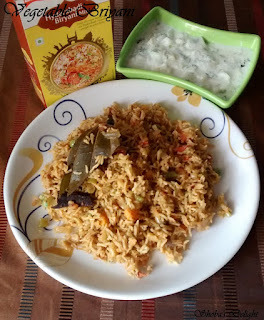 An easy to make yummy side dish for Rice Varieties. 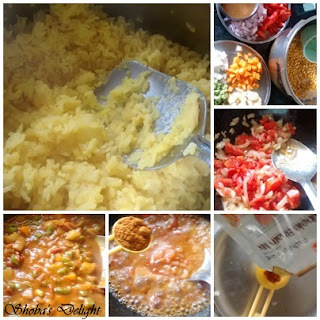 There are many ways to make the dish, yet I like this simple way of making using Sambar powder. I always want this poriyal without changing the shape of the long cuts, so I used to be extra careful while preparing this. At the same time I don’t want to use more oil also. The finished product is a silky smooth eggplant which tickles your taste bud and makes very satisfying meal all together. This brinjal fry is relishing with steam cooked rice and chilled yogurt. 1. Cut each eggplant into 6-8 the lengthwise pieces, and put them in water. Chop onions finely. Crush the garlic pods. 3. Now add the Cut eggplant pieces and sauté them gently. Then add all the spice powders with a tsp of oil. Cover and cook again for 10 – 15 mins, till the brinjal is well cooked. 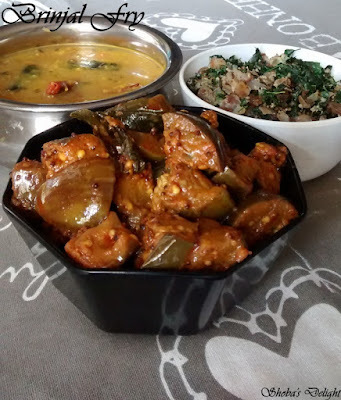 Immerse all the brinjals in water to prevent discoloring.Flip the veggies just one or two times and take care not to mash the veggies.Do not add water to cook the brinjals else it will become mushy. 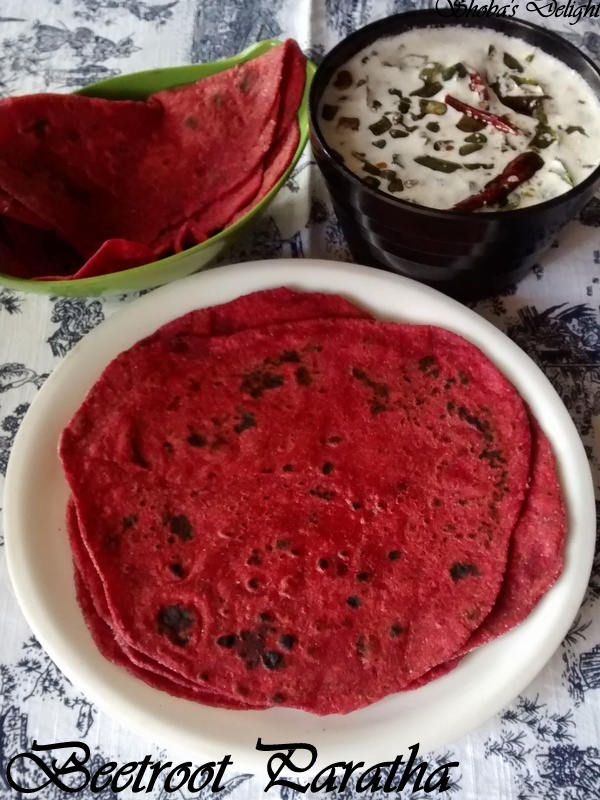 It has lots of health benefits so we try to intake beetroot in different forms. . Just mix few ingredients in the wheat flour and the knead the dough and the paratha dough is ready.You can check out some more paratha recipes like Palak Paratha, Chapati and Tulsi paratha.Today’s recipe is colorful & healthy Beetroot Chapatti / roti. This option is packed full of nutrition and so happy my kid loved this colorful dish and it became her favorite too. 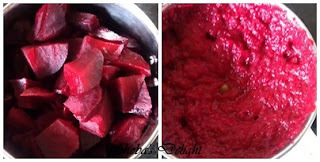 I have posted lots of beetroot recipes in my blog like Beetroot Halwa, Beetroot Pachadi,Beetroot Rice,Beetroot almond milkshake,Beetroot juice,Beetroot and chickpeas gravy and Beetroot poori.Give this a try & tell me how you liked it and now let’s get on with the recipe details. 1. Wash and peel off the skin of beetroot. Grate it very finely. Take a mixing bowl and add the grated beetroot. Add cumin powder, salt, red chilly powder and ghee. Mix all the ingredients. Add whole wheat flour and knead to smooth dough. Sprinkle little water if needed and knead well. 2. Take a small portion of the chapatti dough Roll it using a rolling pin in to a small circle big enough to hold the filling. Place 1-2 tbsp. of the filling in the center. 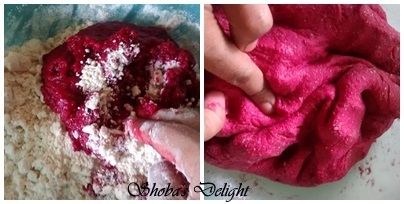 Join all ends together; remove any excess dough (if any) after joining the ends. 3. Using some dry flour, roll the dough stuffed with filling using a rolling pin to get uniform & slightly thick paratha. Heat the pan to medium heat & once hot add the paratha on the pan. 4. Roast it for about a min & then flip. While the other side is cooking, apply some butter/ghee to the top part of paratha. Flip again & let the side with butter cook. Repeat the same step with the other side too. Cook them on both side by drizzling oil to the sides. Enjoy the nice aroma and color of the roti’s. Repeat the above steps to make the remaining paratha's .Apply butter / ghee to the cooked chapatti (optional). It will give nice flavor. 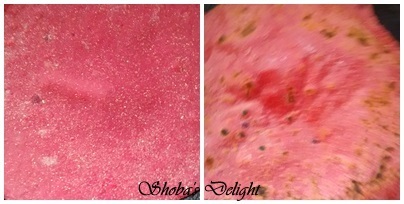 The delicious Beet Chapattis are ready to have. It makes an awesome combo with any of your favorite chutneys, curries or raita.